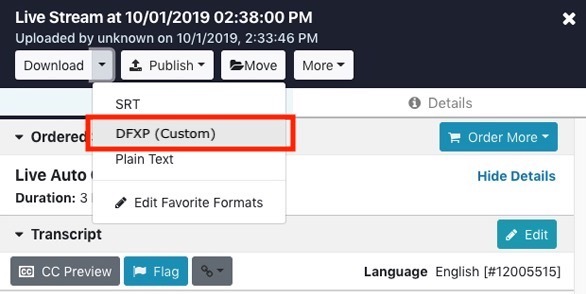 For video platforms that support DFXP captions like Limelight, Ooyala, and Brightcove, you can download a multi-lingual version of your DFXP file from your 3Play account and add it to your video to include all of your translations. To do this content publishing must be enabled within your 3Play Media project. See more information on content publishing. Note that you can also contact 3Play Media to have your DFXP file format configured to always include your translations. From the list of files, click on the file you have had translated. Click the Quick Link button. If you do not see Quick Link button, content publishing is likely disabled. From the list of formats that appear, click DFXP. Click on the first DFXP link under the English section and the file will open in a new browser window. Once you have clicked the link in step 3 and the page with DFXP file opens, the URL should look similar to the example below. Add &multi_language=1 after ?format_id=1 to the URL . It should now look similar to the example below. Hit Enter/Return on your keyboard and the webpage should display the English transcript and all completed translations with timecode for each version. The example below shows the end of a French translation and the beginning of a Chinese translation from a return from a modified DFXP link. Add &dl=1 to the end of the URL and hit Enter/Return on your keyboard. The file should download to your computer. The entire URL should look similar to the example below before downloading it. Log into your video platform and upload the multi-lingual DFXP you downloaded in step 5. Once your multi-lingual DFXP file has been uploaded, your platform's video player should automatically detect the translations included the DFXP file. Once you have uploaded the DFXP, the video player will display a Closed Caption icon with a drop-down menu that gives your audience the ability to toggle between languages. If you are using Ooyala, follow the steps in this article to add the DFXP file to your video (Start at step 5). If you are using Limelight, follow the steps in this article to add the DFXP file to your content (Start at step 3). If you are using Brightcove, follow the steps in this article to add the DFXP file to your video (Start at step 5).